This Thanksgiving I still won’t eat the stuffing, the bread in the Italian Wedding Soup, the mashed potatoes, the corn pudding, pies, cookies, etc. because they contain wheat and dairy I don’t eat. I learned to eat around them, how to scrape off sauces, and fill up on the foods I can eat. And it works out fine. But of course, it’s not like eating at home, where I can eat all those foods because I make them with my ingredients. Interestingly, no one can ever tell the difference. And that is extra lovely. One meal everyone enjoys. To me, that’s bringing people together. I think that’s how most of us on any kind of limited diet feels. Yes, we can make eating at other people’s homes work, but wouldn’t it be fantastic to not get sat at Table 9, the rejects table? Because food allergies stink enough as it is. We don’t need to be reminded of it at the holiday party. Vegans, diabetics, gluten-free people, anyone on restricted diets are people, too! This is why I started recreating recipes that everyone could not just eat, but love. Why can’t everyone love a gluten-free, vegan crisp if the flavors pop with excitement, and the textures dance in your mouth? They can, they can! We can make “free food’ taste just as flavorful and satisfying as food with gluten, wheat, refined sugar, and dairy. We can make food that everyone can enjoy and love without banishing vegans to the bland tofurky table, and separating gluten-free-ers to the dense, dry, I-used-to-be-bread corner. Aren’t the holidays about everyone coming together? For me, the food is an expression of that. Bringing people together with food isn’t just a holiday goal, it’s a lifetime goal. Yes, there will always be foods people don’t like, dishes some prefer over others. We all have our own taste and preferences. That’s different than exclusion due to an allergy, intolerance, or life choice. Realizing that you can make “free food” flavorful and satisfying is the first step. The second is doing it. I truly hope there is a step towards free food in your future. Remember, free food serves you, making it extra fun and delicious. I hope this crisp convinces you of that. Give free food a chance! Have a happy and healthy Thanksgiving! Author: Angela Marinelli, M.S., M.Ed. *If you have a nut allergy you can simply eliminate the almond flour and use 2/3 cup of your gluten-free flour blend (or spelt or wheat). Wash and cut apples, slicing them evenly. You can leave the skins on for added fiber if you like, just be sure to make your slices small enough so they are easy to chew. Mix arrowroot with orange juice to make a slurry. Add vanilla to the slurry. Get out an 11x9 baking dish. Toss sliced apples with orange juice, vanilla slurry as you cut them to keep them from turning brown. Add maple syrup, cranberries, cinnamon, nutmeg, and a pinch of salt. Mix well. Pour filling into an 11 x 9 baking dish. Mix together the maple sugar (or palm sugar if don't have maple), almond flour (I use blanched ground raw almonds, no other filler flours! ), flour of your choice (gluten-free flour blend, spelt, or wheat will all work), nutmeg, sea salt, and orange zest in a mixing bowl. 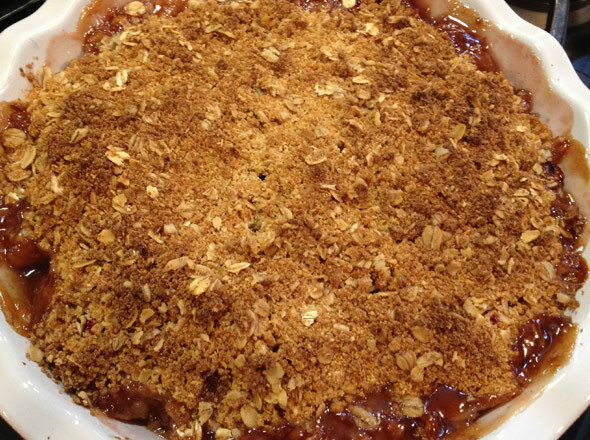 Cut in the non-dairy margarine until it resembles a pea-sized crumble. Sprinkle crumbles on top of filling. 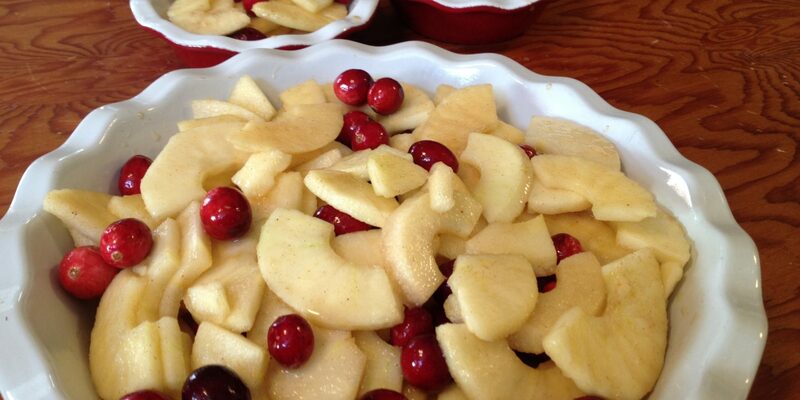 Bake for about 45-60 minutes, until golden brown, and apple are soft. Make sure all the fruit has bubbled, through the crisp. This will ensure the arrowroot has thickened the fruit juices. If it doesn't boil through, it won't thicken. If you use a smaller, deeper baking dish, like a pie dish, causing the fruit to be deeper, it will take longer to cook and boil through, and the overall baking time will be longer. You don't have to let this baby cool very long. You can eat her warm! Once she does cool, cover and store in the fridge. 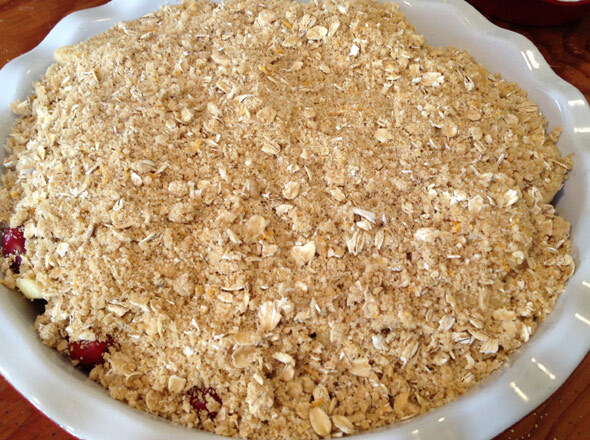 Try my Gluten-free, Vegan Berry Nectarine Crisp!